During my trip to the market, I spotted these Johnsonville chorizo sausages in the meat department. Chorizo is one of my favorite kinds of sausage, especially when I make chorizo and eggs or cook it in my chili. The Latin sausage is basically ground pork with a mix of sweet and spicy seasonings. 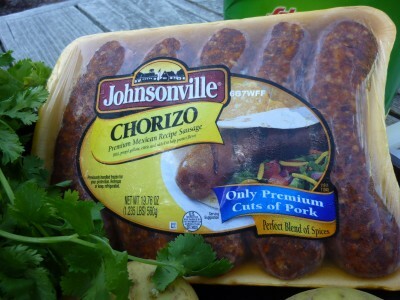 There are different varieties of chorizo, the Johnsonville's are more like a Spanish chorizo because it is coarse meat. Mexican chorizo is very popular, it has finely shredded pork and it's my favorite. On this particular night, it's a work night and I felt like grilling. I need to make something fast and simple for dinner, meat and potatoes were on my mind. 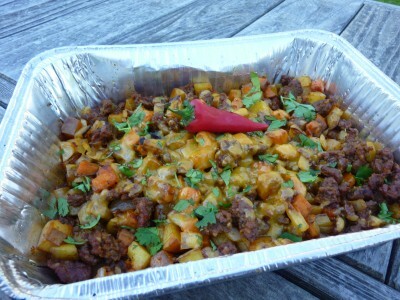 I made these chorizo and potatoes that turned out amazing. 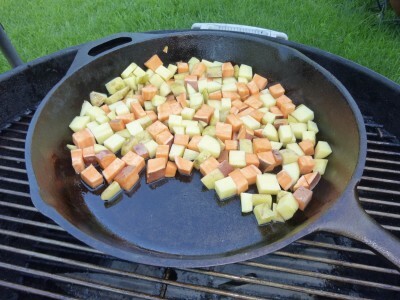 Combine potatoes and oil in a skillet over direct heat on the grill, season with salt & pepper and close the lid. Cook until tender. Remove the casing from the Johnsonville sausages. In a foil pan, crumble the sausage up, add the onion and potatoes. Place over direct heat on the grill and close the lid, cook until the sausage is done and the onion is tender. In the last minute of cooking, add the cheese and let it melt. Remove from the grill and garnish with cilantro. Serve as a burrito or eat by itself. 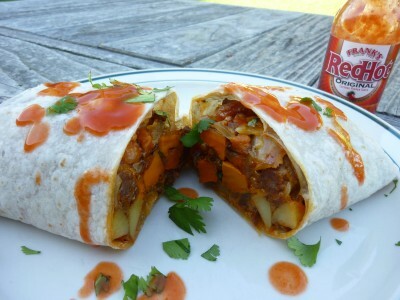 Finally, I wrapped it up in a giant burrito, garnished it with more cilantro and poured a healthy dose of Frank's hot sauce...simple and delisioso! Thanks for the well illustrated food essay. That looks really good. Substitute Salsa Valentina or Salsa Tapatio, and it's even better. I couldn't agree more on using Valentina's, I used the black label (mixed with tequila among other things)to make some very spicy chicken wings.